Sales of optical equipment to the cloud and colo market grew rapidly, reaching record levels in 2Q18, according to the most recent Optical Customer Markets Report issued by networking component and equipment market research firm Cignal AI. Cloud and colo operators such as Google, Microsoft, and Amazon still account for only a fraction of global optical equipment spending but were nearly a quarter of all North American operator purchases during 2Q18. “While cloud and colo spending is still not near traditional telco demand for optical transport equipment, the balance is shifting. This is particularly true in North America, where cloud and colo operators now provide both technical and financial leadership to the supply chain,” said Andrew Schmitt, Directing Analyst at Cignal AI. Released quarterly, the Optical Customer Markets Report quantifies optical equipment sales to five key customer markets – incumbent, wholesale, cable MSO, cloud and colo, and enterprise and government. The current report includes results through the 2Q18 and details equipment vendor market share for sales to cloud operators. Regional forecasts, based on expected spending trends by customer market, are also updated. Incumbent spending accounts for the largest share of all optical spending in the market. In fact, incumbent spending in China is as much as all spending by other incumbent operators worldwide, combined. Outlays by EMEA incumbents increased again in the most recent quarter. Cable MSO spending in North America continues to be very strong and grew both quarter-over-quarter and year-over-year. Ciena led other vendors in direct sales to the cloud/colo market led by strength from the WaveServer platform. Also, newly-combined Infinera and Coriant became the second largest supplier of optical equipment to these customers. Huawei also continues to grow its market share as a result of growing demand from Baidu, Alibaba and Tencent. The Optical Customer Markets Report tracks optical equipment spending by end customer market type and provides forecasts based on expected spending trends on a regional basis. Deliverables include an Excel file with complete data set, PowerPoint summary and Optical Equipment Active Insight. The report includes revenue-based market size for all end customer markets across all regions, with market share for sales to the cloud and colo segment broken out on a worldwide basis. Vendors examined include Adtran, ADVA, Ciena, Cisco, Coriant, Cyan, ECI, Ekinops, Fiberhome, Fujitsu Networks, Huawei, Infinera, Juniper Networks, NEC, Nokia, Padtec, TE Conn, Transmode, Xtera and ZTE. Full report details, as well as other articles and presentations, are available to users who register for a free account on the Cignal AI website. We cannot measure Moore’s law simply in time between generations. Even though it took Intel longer than 2 years to move from 14nm to 10nm silicon, the number of transistors in their 10nm CPUs exceeded Moore’s Law expectation of 2x per 2 years, according to new research by IHS Markit. For example, improving transistor IC design helped Intel grow transistor density from 37.5 Million Transistor per Square Millimeter (Mtr/mm2)to 100.8 Mtr/mm2 between 2014 and 2017. “Since 2007 we’ve seen an immense growth in consumer devices, apps, user-generated content and streaming services, as smart phones and social media gained popularity, driving the need for additional data center (DC) server computational capacity to support them. Connected devices and data-intensive applications will continue to fuel global demand for DC compute and push it up significantly ahead of the average growth of the number of transistors on a CPU,” said Cliff Grossner, Ph.D., Senior Research Director and Advisor for the Cloud and Data Center Research Practice at IHS Markit. “Strong growth in the demand for DC server computation will compel designers of server hardware to think beyond general purpose compute and consider new server architectures purpose-built for parallel computation that will enable artificial intelligence, advanced driver assistance systems and real-time rendering for virtual and augmented reality amongst others,” Cliff added. · Cloud service providers are expected to buy 37% of 2017 DC servers shipped, telco 15% and enterprise 48%. · White Box – including all vendors that produce rack server hardware with OS software sold separately, such as QCT, Wiwynn and Inventec – was #1 in units shipped in 3Q17 (23% share) for DC servers. The IHS Markit Data Center Compute Intelligence Service provides quarterly worldwide and regional market size, vendor market share, forecasts through 2021, analysis and trends for (1) data center servers by form factor[rack, blade, open compute and tower], server class[entry-level, enterprise, large-scale enterprise, large-scale compute and high performance compute], and market segment[Enterprise, Telco and Cloud Service Provider], and (2) Ethernet network adapters by CPU offload[Basic, Offload and Programmable NIC], port speed [1/10/25/40/50/100GE], form factor [stand-up, piggyback and open compite], usage case [storage and server] and market segment. Vendors tracked include Dell, HPE, Lenovo, Cisco, Huawei, Inspur, IBM, Supermicro, Cray, Intel, Broadcom, Mellanox, Cavium, and others. Between 2 percent and 3 percent of developed countries’ electricity consumption is currently attributed to data centers. For most data centers, the largest operational cost is the electricity used for cooling. Onsite generation is the ideal way to implement renewable energy in data centers. The two most popular renewable energy methods are solar and wind power, due to their high-energy production and relative ease of implementation. Offsite renewable energy sources — primarily utility companies and renewable energy suppliers — are typically the easiest way for data centers to obtain renewable energy. Offsite generation removes the large upfront capital expenses to produce onsite renewable energy and the geographical limitations of renewable energy production methods. Although small data centers have a distinct advantage in using onsite options, owners of hyperscale data centers (i.e., Apple, Google, Microsoft, Amazon and Facebook) are driving the growth of renewable energy for data centers. Market research firms Dell’Oro and Heavy Reading disagree on who are the top optical network equipment vendors, especially for data center interconnect (DCI). Obviously, the mega cloud computing/Internet service providers (Google, Amazon, Baidu, Facebook, etc) together account for the overwhelming market for DCI equipment purchased. None of them disclose who their DWDM vendors are. It’s well known that most of those mega cloud/Internet players design their own IT equipment (e.g. compute servers, Ethernet switches, Routers, etc), but they don’t design or build DWDM transport gear. Ciena, Cisco and Infinera together command 85% of the disaggregated wavelength-division multiplexing field for DCI optical network equipment market segment, Dell’Oro Group estimates. –>This is a big surprise to this author as neither Nokia (via Alcatel-Lucent), Huawei (#1 overall optical network vendor) or ZTE are top tier according to Dell’Oro. See two graphs below (“Other Voices” section), courtesy of Heavy Reading and IHS-Markit. Dell’Oro Group estimated that disaggregated WDM systems reached an annualized revenue run rate of $400 million, growing 225% year-over-year. This is partly because these systems are finding utility in the booming DCI market segment. Jimmy Yu, VP at Dell’Oro Group, said that while the disaggregation concept is not new, service provider adoption in the data center segment is. As wireline operators look to diversify their revenue mix, the DCI market has a compelling growth path driven by the consumption and distribution of various data forms over the public internet and private networks. Outside of DCI, the overall WDM market, which consists of WDM Metro and DWDM Long Haul, grew only 2% year-over-year in the second quarter, says Dell’Oro. The research firm noted that growth was driven by strength in the Asia Pacific region, especially China and India. The share of 100G WDM wavelength shipments going to DCI was 14% in the quarter, according to Dell’Oro. The Dell’Oro Group Optical Transport Quarterly Report offers complete, in-depth coverage of the market with tables covering manufacturers’ revenue, average selling prices, unit shipments (by speed including 40 Gbps, 100 Gbps, and >100 Gbps). The report tracks DWDM long haul terrestrial, WDM metro, multiservice multiplexers (SONET/SDH), optical switch, optical packet platforms, and data center interconnect (metro and long haul). To purchase this report, call Matt Dear at +1.650.622.9400 x223 or email Matt@DellOro.com. Huawei and ZTE saw record shipments of 100-Gbps coherent ports in China during the second quarter of 2017 as well as strong sales in general throughout the region, reports Cignal AI. So what accounts for sour grapes from optical component houses? Inventory corrections at Chinese systems vendors, particularly Huawei, according to the market research firm. Optical revenue in China is up 13 percent for the first half of 2017 as compared to the same period in 2016. The weak demand reported by component makers is a result of an ongoing inventory correction (primarily at Huawei), rather than a signal of weak end market demand. Huawei ranked first overall in combined market presence and market leadership in the recent Optical Network Hardware Vendor Scorecard released by IHS Markit. Huawei received this assessment for its comprehensive performance on multiple benchmarks including reputation for innovation, market share momentum, and global market share. There are over a dozen vendors around the globe that make and sell optical network equipment. The 10 vendors profiled in this Scorecard–ADVA, Ciena, Cisco, Coriant, ECI, Fujitsu, Huawei, Infinera, Nokia, and ZTE–were selected because they are the top revenue producers of optical hardware. The Scorecard used concrete data and metrics, including market share, financials and direct feedback from buyers on innovation, product reliability, service and support to evaluate 2016 market performance and future momentum of the top 10 optical network equipment vendors. Market share estimates are based on DCI revenue contribution by Heavy Reading’s definition (not disclosed in the teaser briefing). Most vendors do not currently break out from their broader metro WDM revenue the portion accounted for by metro DCI deployments. A few companies did provide Heavy Reading with some general guidance on their revenue from metro DCI. 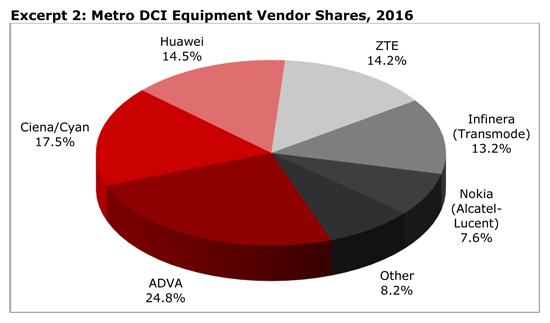 The pie chart figure below shows Heavy Reading’s metro DCI equipment vendor share estimates for 2016. Note that Adva has the top vendor market share and Cisco is not represented in the figure.